Editor’s Note: This post was published in 2015 for informational purposes only and was updated to reflect recent data in 2018. If you or someone you know is having thoughts of suicide or self-harm, head over to the American Foundation for Suicide Prevention to find immediate support. Punctuation helps you say exactly what you mean, but few think of it as more than a way to pause or end a sentence. But to thousands affected by suicide, the semicolon has become an important signifier of survival. Thanks to Amy Bleuel, the often misunderstood symbol has morphed from a simple punctuation mark to a badge of pride for those who struggle with depression, suicide, addiction, anxiety, and self-injury. Bleuel, who died by suicide in 2017, started the nonprofit movement Project Semicolon in April 2013 to honor her father, who took his own life, and to give voice to her fight with mental illness. The idea was to encourage anyone who has been through a similar experience to draw a semicolon on their body, photograph it, and share it on a given day to encourage love and to inspire. “A semicolon is used when an author could’ve chosen to end their sentence, but chose not to. 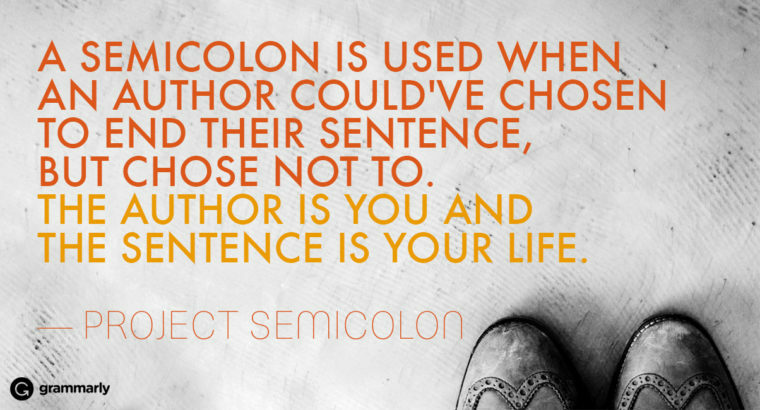 The author is you, and the sentence is your life,” explains Project Semicolon’s website. Semicolon tattoos are everywhere: on wrists, behind ears, above ankle bones, and more. According to the Substance Abuse and Mental Health Administration’s 2016 National Survey on Drug Use and Health, 9.8 million seriously thought about committing suicide. This is a separate number from those who have a mental illness, as the two are not always related. And that’s exactly what the semicolon tattoo is working to change—the stigma around suicide. Just as the mark is a sign for readers to pause before continuing a sentence, participants have embraced the symbol as a reminder that their story isn’t over yet—and that they should tell it. The brave, honest accounts these tattoos have inspired brought a community together and endow members with the kind of pride that is capable of breaking down stigma. What’s more, the tattoo has encouraged people to demand recognition for and discussion about illnesses that often skate by under the radar because they are invisible. Ink has always been a conversation starter, and the semicolon emblem is no different. It’s an opportunity for survivors, those who battle every day, and even supporters to talk to those unacquainted with suicide.